Comments: Note the Golden Virginia Tobacco advertising billboard, banned from 14/02/2003. Comments: View of the Broadway Cinema. It was during the late 1920s and 1930s that the Broadway took on the appearance that is still architecturally the most striking feature of the shopping facilities at Pitsea. This was all due to the work of one man: Harold George Howard. 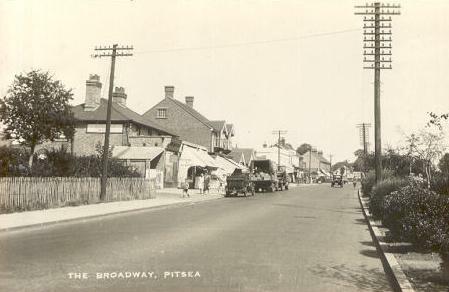 His legacy to Pitsea began in the late 1920s with a series of mock Tudor style buildings beginning with the Railway Hotel public house, and continuing with the cinema, which opened as The Broadway in 1929 and later became the Century, and the parade of shops adjoining it known as Tudor Mansions and Tudor Chambers, and lastly Tudor Buildings (Anne Boleyn Mansions), occupied by Lloyds (now Lloyds T.S.B.) Bank since the 1930s. His name is perpetuated in the local park, where his privately funded war memorial now stands, and in Howard Crescent which borders the park and features his residential designed homes. He was a noted landowner, farmer and successful businessman founding Howard's Dairies around 1900, which for many years had shops at Pitsea, Laindon, Langdon Hills, Whitmore Way, Timberlog Lane and Southernhay in Basildon town centre. The company's horse-drawn and later electrically powered milk floats finished in a dark blue and cream livery went on to become one of the leading milk delivery services in south east Essex. Howard's Dairies also had distribution depots at Tennyson Drive, Pitsea and Bluehouses, Basildon. At the time of his death in 1961 the company, which had its headquarters at 265 London Road, Westcliff-on-Sea, had a 73,000 customer base, 8 distribution depots, 212 retail delivery rounds, 33 shops and employed over 1000 people. He lived for a time at Blue House Farm in London Road, and died 7th June 1961 aged 86 and is buried at St. Margaret's Church, Bowers Gifford. In February 1961 the main Pitsea Crown post office was opened in Broadway North until relocating to nearby Tesco's superstore from Monday 11th October, 1993.